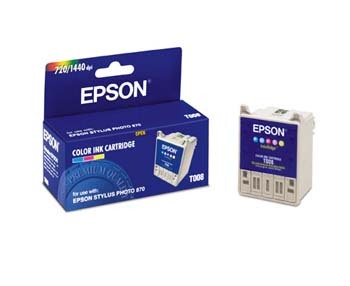 Genuine Epson S187093 Black Stylus Replacement Ink Jet Cartridges for the Epson Stylus Color 400/ 440/ 600/ 640/ 660/ 670, Stylus Photo 700/ 750/ 1200, Photo Ex printers. 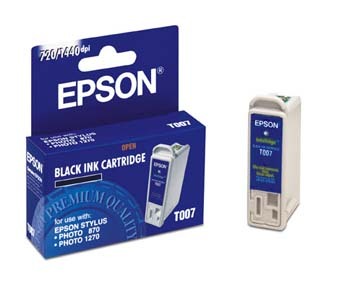 Genuine Epson T007201 Black Ink Cartridge for Epson Stylus Color Stylus Photo 780/ 785EPX/ 825/ 870/ 875DC/ 890/ 1270/ 1280 printers. Genuine Epson T008201 Five-Color Ink Cartridge for Epson Stylus Color Stylus Photo 780/ 785EPX/ 825/ 870/ 875DC/ 890 printers. 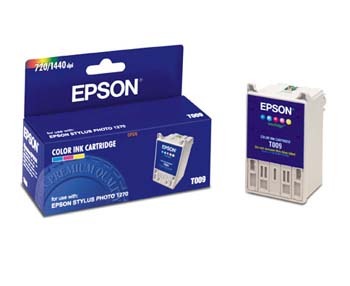 Genuine Epson T009201 Five-Color Ink Cartridge for Epson Stylus Color Stylus Photo 900/ 1270/ 1280 printers. Genuine Epson T026201 Black Ink Cartridge for Epson Stylus Color Stylus Photo 820/ 925 printers. Genuine Epson T027201 Tri-Color Ink Cartridge for Epson Stylus Color Stylus Photo 820/ 925 printers.